When is the client ready? Q: How did you come to develop your own unique treatments; i.e., iChange Therapy? Hypnotherapy is very intuitive work. During training in hypnotherapeutic treatment, I learned techniques in induction, looked at case histories of what other people have done; but, in actual practice the work with each client is unique. I am guided in that work by spirit, by my inner wisdom and that of the clients. I believe there is a universal divine that we tap into. We all have an inner source of light and wisdom. When that is aligned with the universal divine all answers are available. As I work with clients, I go into trance with them. It’s necessary that I clear my own energies and be grounded. This allows me to be open to insights that come my way. I surprise myself all the time. I don’t know exactly what’s going to happen. But, I do trust the something good and magical will happen. Q: Is a typical for a hypnotherapist to go into trance with clients? Many do. Some do not. It depends on the therapist. For me, it’s more effective if I go into trance with them. It gives me a more profound sense of empathy. Q: Does the empathetic response help you to help them resolve issues? There are many things that depend on the nature of the client. Trance is induced by different techniques. Often, the success of one technique versus another depends on the ability of the therapist to consider why the client is responding in a particular way. 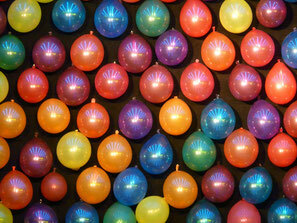 One method of induction is to encourage the client to visualize colored balloons. I had a male client who could see the yellow and blue balloons, but when I got to the red balloon he drew a blank. He was doing so well and seemed so sincere that this seemed an inconsistent response. Then it dawned on me that he might be colorblind. I never thought to ask. And, indeed, that was the case. So, in trance work, one has to be very open and cannot get stuck on one standard procedure. There is no such thing as a standard procedure in hypnotherapy. It’s imperative to go with the flow and deal with what the client presents. I learned early on that the therapist is not in a position to choose what the client wants to work on. When the client gets in trance, her inner wisdom takes you where she needs to go. The job of the hypnotherapist is to facilitate and guide. The client charts her own course. I help navigate. If one mode of transportation doesn’t get the client where we need to go, I try a new mode. Q: How do you determine when a client is truly ready to engage in therapeutic work? The pre-induction talk is very important. Early in my practice it became evident that if the client appeared not to be ready it was likely because they had insufficient education about the process. I agree with any client who says they cannot be hypnotized. They cannot be forced if they do not want to do it. To get around that, to get a more effective trance (or transformation), the therapist and the client must understand the nature of the sacred contract. The client must trust the therapist implicitly and be willing to be guided. Even someone coming in thinking they are ready; if they have fears and doubts about the process or whether or not it will work; or concerns about the trustworthiness of the therapist; it won’t work. It’s not that it won’t work because the client cannot be hypnotized; it’s that the client does not want to be. Where, perhaps deep down inside, they don’t really want to change. There is no such thing as hypnosis not working. The crux of the process is whether or not there is agreement between client and therapist. Hypnosis works. Q: Might you withhold hypnosis if a client expresses an interest but you sense they are not really ready to work on the issue? Withhold is not the right term. There is a very real need to establish rapport. Making an appointment and showing up indicates an initial desire to do the work. However, desire alone is insufficient. They also need to be educated and motivated. Then they need to believe. Only when all those elements are present will it work. So, yes, as the therapist I make the decision on whether or not to hypnotize a client. And that decision is based on several criteria. But the critical criteria is consent. They must agree. Movies such as the Manchurian Candidate are not true. It is all drama, entertainment. There must be consent before hypnosis can work.